OECD issued Economic Policy Reforms: Going for Growth report that reviews progress in structural reforms in areas related to Going for Growth policy recommendations over the period 2015-16. In the Czech Republic, the report says, convergence in incomes and productivity has slowed down since the 2008 crisis, reflecting mainly a deceleration in total factor productivity. GDP per capita remains 36% below the average of the most advanced OECD countries. 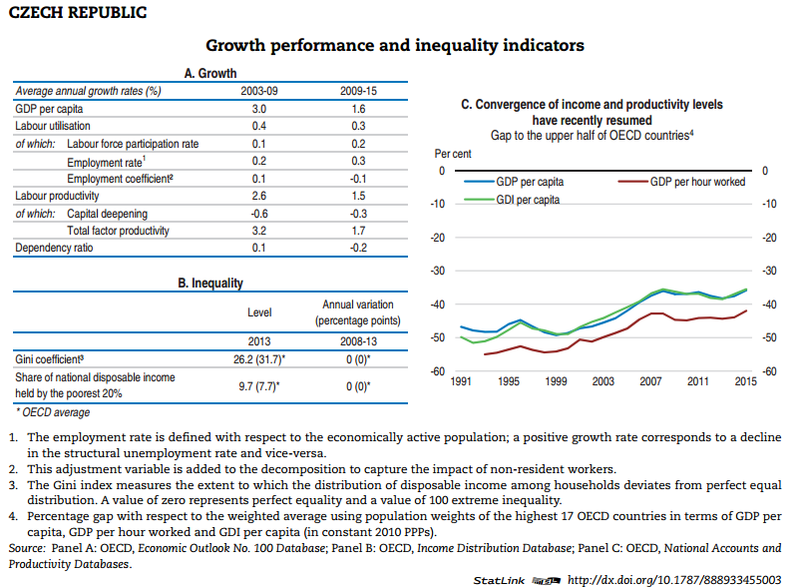 Inequality has been stable, remaining below the OECD average. The poorest 20% of households receive close to 10% of total disposable income, which is a larger share than in the OECD on average. In recent years, policies to expand access to childcare increase the linkages between the education system and employers and encourage greater collaboration in R&D between businesses and research institutions have addressed some of the Going for Growth 2015 priorities. Tax reform has been dropped as a standalone policy priority but there is considerable scope for reform to promote inclusive growth. The average tax wedge for low-income earners should be lowered and the progressivity of the tax system should be increased. Furthermore, the overall tax burden should still be shifted from direct to less distorting taxes, such as environmental and immovable property taxes. Improving the effectiveness of the public sector would support productivity growth and raise the quality of public services for all. More co-ordination and oversight, better planning and evaluation, and greater focus on measuring and publishing outcomes and results would increase the effectiveness of public spending. More efforts are needed to overcome the challenges of territorial fragmentation, using joint provision of services and benchmarking service providers. Deeper reforms to improve gender equity in the labour market and make the education system more equitable and improve skill development would increase incomes and inclusiveness of growth. Measures to make R&D and innovation support more effective, strengthen the competitiveness of markets and improve the vocational education and training system are needed to foster productivity. Make the labour market more gender inclusive. Enhance equity and outcomes in education. Enhance competition in the domestic economy. Improve R&D and innovation policies. Improve the effectiveness of the public sector. Convergence of income and productivity levels have recently resumed, OECD report shows.